Russian President Vladimir Putin as the supreme commander of the Armed Forces determines all the major directions of Russia's military operation in Syria, Kremlin spokesman Dmitry Peskov said on Thursday. MOSCOW (Sputnik) — Earlier in the day, the Russian reconciliation center said it was preparing the evacuation of militants and their families out of the eastern Aleppo in accordance with Putin's order. "The president is the Commander in Chief and the president defines the main strategic directions of our Defense Ministry, including the operation, which [our forces] are carrying out in Syria. Therefore, it is obvious that all of the major directions of the operation are coordinated with the commander in chief, and carried out by his direct orders," Peskov told reporters answering why Putin's order was mentioned in the statement issued by the reconciliation center. Over the recent months, Aleppo became a major battleground in Syria with the government troops seeking to liberate the city divided into the western part held by the government and the eastern part controlled by the militants. The Russian reconciliation center said Wednesday only 1 square mile of the city's territory was still under the militants’ control. 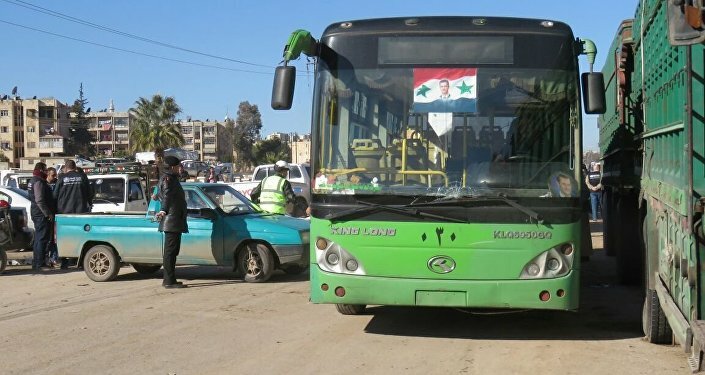 According to the Russian reconciliation center, the evacuation of militants from the city will be carried out by 20 buses and 10 ambulances via a special corridor to Idlib.